TAM, the largest airline in the Southern Hemisphere, joined the Star Alliance last week. This is very, very exciting news. Star Alliance options to South America were quite limited from North America — there was Air Canada from Toronto, United from Washington Dulles and occasionally Chicago, Continental from Newark and Houston, and US Airways from Charlotte. Availability generally isn’t great, but the real issue was flights within South America. Besides the Sao Paulo to Rio de Janeiro tag flights operated by a few airlines, the only other Star Alliance service was Air Canada between Buenos Aires and Santiago a few times a week. Well, now we have a massive airline that can take us all over South America. TAM flies from several places in the US to Sao Paulo, including New York, Miami, and Orlando, and best of all they provide connections to virtually any place in South America. The other really awesome news is that they have a proper first class product. Their first class cabin is one row and has four seats which makes it very private, but they still do seem to have excellent award availability. I see many flights between Orlando and Sao Paulo with two first class award seats. Business class is wide open on many routes. And all of this is searchable via the ANA tool. So overall I’m really, really excited about this. 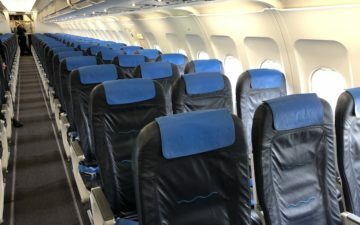 While United has a first class product to South America, most of their routes are operated by the 767 which only have five first class seats for sale. That means you’ll never see a United first class seat to South America on an award ticket.